Healthy, wealthy and wise. Sustainability has been on the agenda of managers and investors in real estate vehicles for a number of years, though until recently this just tended to mean having a general policy, without any detailed plans for its implementation. But over the last few years sustainability has moved higher up the agenda, reflected in the development of more specific sustainability policies, which are now being applied with greater speed and urgency. At the same time a growing number of vehicle managers have been integrating sustainability into their strategic thinking. To encourage this trend, INREV has developed the INREV Sustainability Reporting Guidelines. These are intended to make the sustainability activities of vehicle managers more visible, to continually challenge managers to improve their sustainability policies with concrete action plans at the asset level, and to enhance industry transparency in the area. The Guidelines have been designed to generate a precise description of the sustainability policies of managers and vehicles, in line with current industry standards such as GRESB, GRI and EPRA. They form part of the overall INREV Reporting Guidelines and the INREV Guidelines compliance framework. The Guidelines highlight environmental, social and governance issues. The standards include reporting requirements which are mandatory under the INREV Guidelines compliance framework and additional best practices which can be adopted in reporting practices voluntarily. The Sustainability Reporting Guidelines have been structured to reflect a logical progression from strategy to action to practical outcomes. A long­term ESG strategy, stretching from portfolio to asset level, would be expected to produce annual objectives and targets, against which practical progress can be measured, for instance in terms of energy consumption and CO2 emissions. Reporting in line with the Guidelines should focus the minds of vehicle managers, while allowing investors to follow their progress. Investors will also have more evidence to hand when asking managers to boost the ESG content of their strategies. This should in turn make vehicles more futureproof and boost their potential risk/return profile. In the realm of real estate, these considerations are important both for reducing long­term costs and for attracting and retaining tenants. HWP is likely to provide many benefits for real estate asset values and costs, not least through the impact on construction costs and energy consumption. A ‘virtuous circle’ of good design can work in favour of both the people and the planet, for example by maximising the use of natural light, enabling user control and designing in biodiversity. The Sustainability Reporting Guidelines have been structured to reflect a logical progression from strategy to action to practical outcomes. A report by McGraw­Hill (2014) confirmed that buildings can maximise the benefits for people while still leaving the planet better off. The idea of building quality now means one that is low carbon, resource efficient, healthy and productive. The example in Figure 1 below (which should not be used to draw precise quantitative conclusions) shows the long term costs of a regular office building compared to those of a sustainable building focused on health, wellbeing and productivity. For the sustainable building, the additional investment on indoor climate and long term maintenance costs will be higher, but the impact in reducing energy consumption, sick leave and productivity loss is highly likely to outweigh these additional costs. Buildings with a healthier internal climate show productivity gains compared to more traditionally constructed buildings. 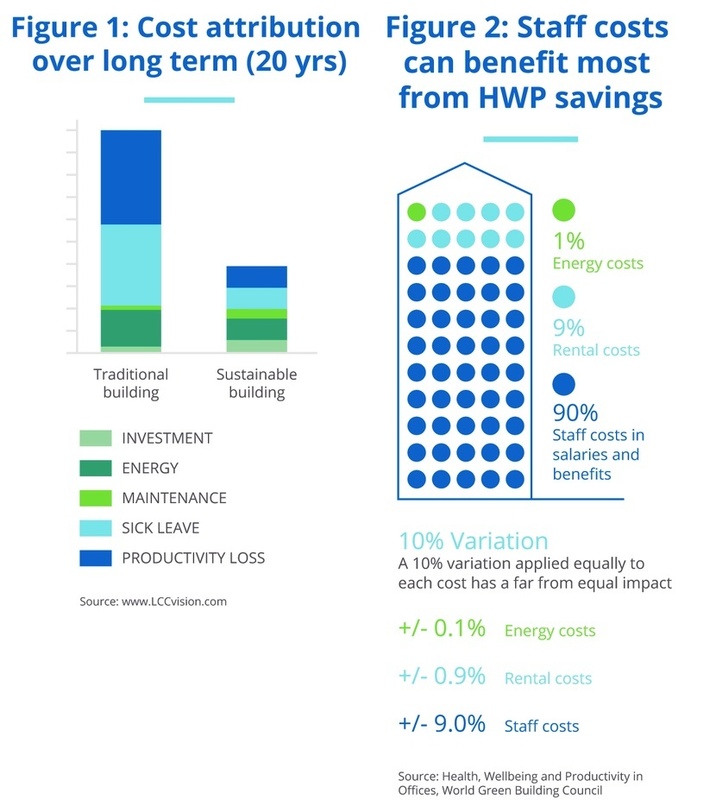 Quantifying the impact of HWP costs and savings represents a challenge for the near future. The McGrawHill study suggests that HWP­focused buildings produce healthcare costs 1­5% lower than for traditional buildings, while more than 60% of tenants report higher work satisfaction, and productivity is reckoned to be 1% higher. Reporting in line with the Guidelines should focus the minds of vehicle managers, while allowing investors to follow their progress. The role of sustainability in real estate was discussed further at a webinar organised by INREV and hosted by JLL on 13 June. A recording can be accessed on the INREV website under past trainings. This provides an update on the evolution of sustainable investment in the industry, highlighting best practices in the area. During the webinar, Sophie Carruth, Head of Sustainability ­ Europe at LaSalle Investment Management, presented some of the latest ways for implementing sustainable solutions and enhancing performance. The webinar also covered the way in which the health and well­being of tenants and customers can translate into higher productivity, and the issues surrounding energy certification. Health, wellbeing and productivity is the new carbon deal. To conclude, all stakeholders in real estate should benefit from implementing the sustainability reporting guidelines. Investors will get clearer and more quantified insights on the impact of sustainability measures – both proposed and actual. Tenants will gain financially as a result of reduced sick leave, increased employee satisfaction and greater attractiveness to potential employees. And last but not least, the impact on the planet will be positive. Peter van den Tol, Sweco is a member of the INREV Sustainability Committee.